The island of Samos is situated in the Eastern Aegean off the Turkish coast. The island is ca. 35 kilometres long and has two gigantic mountains that rise to a height of 1400 metres. Samos is one of the greenest Greek islands and has a dense cover of forests and olive groves. Most of the beaches on Samos are shingle beaches, but often sandy once you get into the water. Two exceptions to the rule are the beaches of Psili Ammos East and Psili Ammos West, as both of them have fine white sand. The main holiday resorts on Samos include Kokkari, Samos Town and Karlovassi in the north, and Pythagorion, Votsalakia and Ireon in the south. The centre of the island offers fantastic panoramic views and picturesque mountain villages. Samos is also famous for its wine and the island produces a lot of it. Muscat grapes make very good wine, some of them dry, but mainly the sweet varieties for liqueur wines. Don’t forget to try local table wine at the restaurants, the quality will amaze you. Luckily there is no need to bring home a heavy suitcase filled with Samos wine, as it is much easier to order online. Agios Konstantinos is an upcoming holiday resort on the north coast of Samos not far from Kokkari. A lot of Samos lovers have their villas here and spend the summer months on their favourite island. In recent years the tourist infrastructure has been boosted, and there are numerous taverns and bars along the coastal road now. There is also a supermarket, a bakery and a pharmacy. The small harbour is very picturesque and is surrounded by several restaurants. Due to the permanently windy conditions, Agios Konstantinos doesn’t have a beach. There is, however, a good selection of brilliant beaches in the vicinity. For those who like a quiet holiday and don’t need a beach outside their front door, Agios Konstantinos is just the place. Having a hire car to get around in is a good idea. Make sure you compare prices at different car hire places, as they can vary considerably. Ireon is the little sister of Pythagorio and is situated at the foot of a mountain range. Things still move at a leisurely pace here. Although it is obvious that the resort has been designed on the drawing board, it has a certain charm and is one of the most beautiful places on Samos. A week’s holiday won’t be too long in Ireon, as there is an adequate choice of bars and taverns. Along the seafront a variety of restaurants and taverns can be found, ideal for an evening stroll before dinner, and there are souvenir shops too. Every year there is a rock festival in August, with a line-up of well-known international bands. Ireon is a good alternative to Pythagorio. There is a long pebble beach between the two resorts, many parts of which are managed. Kalami is a small holiday village outside Samos Town. Along the coastal road, a few hotels and apartments can be found. The coast is quite steep here and there is only the occasional bathing bay. Kalami is a good place for a quiet holiday, with a beautiful view of Samos Town and the bay right down to Kokkari. It is so close to the main port of the island, that you can see a lot of passing ferries and cruise ships. There is only a small selection of entertainment options in Kalami, but it is not far to the capital. Karlovassi is the second biggest town of Samos. In the north-eastern part of the island, everything is geared towards everyday life. This is not a tourist region, but there are most types of shops including the big names. Near Karlovassi lies the Potami Beach, one of the most beautiful beaches on the island. There is a lovely walk from Potami Beach to waterfalls of the same name, where you can swim in a little river with icy cold water. There are a few more bathing bays for a pleasant beach holiday, but access is quite difficult. In terms of tourist infrastructure, Karlovassi hasn’t got much to offer, and there are fewer taverns around the lively harbour than in other places on Samos. Kerveli is a small holiday resort situated in a pretty bay in the east of the island. It has a small beach that is very popular with the locals. Small colourful boats bob in the water, and holiday-makers can laze away the day in one of the beach taverns. Apart from the main beach, there are further bathing bays for holiday-makers, but they are directly in front of the hotels who use them for their guests. For excursions into the surrounding area, it is a good idea to hire a car, as the roads are steep and unsuitable for walking. The former fishing village of Kokkari is the tourist centre on the north coast of Samos. It is one of the most attractive villages on the island, with a long sandy beach that nestles into the crescent of a mountain range. With its narrow lanes and a beautiful harbour, the resort offers an ideal combination between beach and urban infrastructure. Many holiday-makers who have been to Kokkari once, return year after year. Most hotels are lined up along the beach, whereas the majority of restaurants and bars surround the little harbour. Along the road between the harbour and the beach many boutiques, jewellery shops and souvenir shops are to be found. Kokkari is also very popular with surfers, as it is virtually always windy. Apart from the long main beach, there are several other exceptionally attractive bays. All of them are managed and within walking distance. Both parts of the resort have great bars, and holiday-makers are spoilt for choice whether to sip their cocktail on the beach or by the harbour. Hiring a car provides independence to explore the island, and there are two very picturesque mountain villages in the immediate vicinity of Kokkari: the car-free artists’villages of Manolates and Vourliotes, both complete with fantastic panoramic views and very pretty village squares. Koumeika is a quiet little village situated in the foothills of a mountain range on Samos. The village has a beautiful tavern that is particularly popular with locals. Outside the village, accommodation is available for holiday-makers in search of total peace and quiet. The view from here across the bay and the neighbouring islands of Fourni and Ikaria is stunning. Koumeika is for self-catering tourists, as the tourist infrastructure is not sufficiently developed. The small settlement of Limnionas lies in the south-west of Samos near the sandy beach of Psili Ammos. The picturesque village nestles into a bay and has a few small taverns. Those who like just a beach holiday will find everything they need in Limnionas; the nearest towns on Samos are, however, a long way away. The road along the village abruptly comes to an end at the “Tavern at the end of the world”, which is definitely worth a visit. Those who are adventurous enough to go there need to hire a jeep or a motorbike, as ordinary cars tend to struggle on the narrow dirt track. Accommodation in this part of Samos is to be found along the road. Marathokampos is really only an inland village. 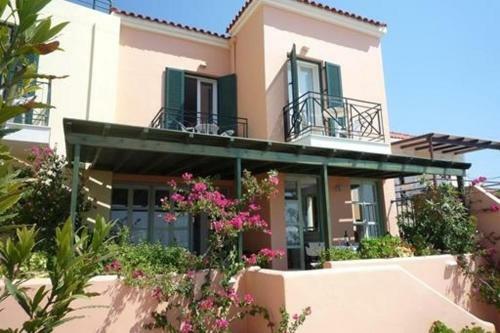 For holiday-makers, the harbour village Ormos Marathokampos is a lot more interesting. Around the harbour, there is the obligatory group of taverns and bars. Accommodation is limited here, which creates quite an informal atmosphere, as everybody knows everybody else. The pebble beach extends along most of the bay and there are many other beautiful and secluded bays in this region. Those who like solitude and a small piece of original Greece will find what they are looking for in Marathokampos. Messokambos is a small settlement scattered around the main road from Pythagoria to Samos Town. This region is only suitable for holiday-makers who can do without a tourist infrastructure altogether. Accommodation is available between the fields towards the Myakali Beach. It is essential to have a hire car in order to enjoy a holiday in Messokambos. Posidonio is a small fishing village with a beautiful view of the Turkish coast. The Aegean Sea is quite narrow here, but also particularly beautiful, with the bay surrounding the village like a frame. The taverns serve excellent Greek food. For a longer stay, though, there simply aren’t enough things to do. That’s why most visitors of Posidonio just come for the day, onboard one of the tourist boats from Pythagorio. The privately owned sunbeds on the beach can be used free of charge, which is the reason for the fact that it gets very busy. Potokaki might be called the home beach of Pythagorio. The resort doesn’t have a proper centre, as hotels and taverns are lined up along the coastal road. Due to its proximity to neighbouring resorts a lot of people use Potokaki just for accommodation, as it is not a holiday resort in its own right. There is a minimum of infrastructure in the shape of Mini Markets and there is a car hire place as well. Psili Ammos is a very small resort that has developed around the beach. It has one of the two sandy beaches on Samos and lies very close to Samos town and Pythagorio. You will find the resort of Psili Ammos at the end of the coastal road of Mykali. Directly next to the village is a small restricted military area, from where Turkey is constantly observed. But don’t worry, holiday-makers on the beach don’t even know anything about it. The beach has got several taverns and bars. Pythagorion is the main tourist centre in the south of the Eastern Aegean Island of Samos. The picturesque little town is situated near a small hillside and has one of the most beautiful harbours in the Aegean. During the summer months it is busy with visiting yachts of all sizes, which makes an evening stroll along the harbour region particularly interesting. Pythagorio has many good taverns around the harbour and there are very picturesque lanes around town. Samos cuisine is a little more refined than that of other islands, and there is a large enough choice to last gourmets even for a longer holiday. Directly in the town there are only two smallish beaches. Outside the town, however, there are a few hotel complexes right on the beach. Only two kilometres from Pythagorio, there is a very long beach that extends along the whole bay all the way to Ireon. Those who don’t want to hire a car, can take a leisure boat to the most beautiful beaches in the surrounding area, a different one each day (approximately 25€ per person). Samos Town (Vathi) is the busy capital of the Eastern Aegean Island of Samos. Here the port of the island is to be found, as well as more tourist infrastructure than anywhere else on the island. Along the marina, there is a multitude of shops as well as some bars and restaurants. The town centre is not really suitable for a holiday on Samos; there are very few romantic lanes, a lot less than in other resorts. The old town of Ano Vathi is worth a visit, with its bustling everyday Greek island life. Samos Town has a beautiful Archaeological Museum with, amongst other things, the statue of an extremely well-preserved kouros (young man), probably a young athlete. For holiday-makers in Samos Town, the region a little outside the town has a lot to offer. The suburb of Kalami has some beautiful bathing bays with hotels, taverns and bars. Bus connections are regular and include all destinations you might want to go to. As part of a holiday on Samos, you should allocate at least two days to visiting Vathi. Votsalakia translates as “small pebble”, which is not really the official place name of this region of Samos. It used to be just the name of one of the oldest local taverns; but in the course of time “Votsalakia” has become more commonly used than the original place name of “Kampos”. The trademark of the region is the long beach, where countless hotels, taverns and bars have taken up residency within the last few years. In the background towers the Kerkis Mountain Range, rising up to 1400 meters and surrounding the whole area with its olive groves. The long dawn-out resort of Votsalakiais one of the main holiday regions on Samos.